Professor Yuji Yamamoto and his colleagues at Nagoya University analyzed patterns of movement and space between two players in Kendo matches (Japanese Art of Fencing) and determined difference in behavior between those at expert level and those at intermediate level. Their paper was published online in PLoS ONE on September 4, 2013. In daily life, people make instantaneous decisions every day and execute appropriate movements; however, the underlying mechanism of this quick judgment and movement in an unpredictable environment has not been explained. Professor Yamamoto studied the dynamics through a detailed analysis of human movement in one-on-one sports. 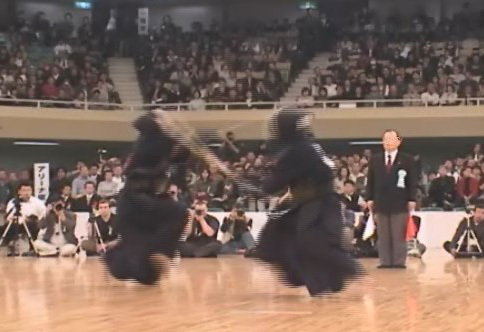 First, he recorded 24 5-minute Kendo matches and calculated the distance between the two participants and the velocity of their each move (6 players at the expert level and 6 players at the intermediate level participated and were matched against opponents with the same skill level). As a result, Prof. Yamamoto and his colleagues discovered that although rapid motions in Kendo appear complicated, they comprise only 6 basic functions. Furthermore, they concluded that combinations of the basic functions can be categorized into two states--"the farthest apart" high-velocity state and "the nearest (close) together" low-velocity state--and that the experts prefer the former and the intermediates prefer the latter. Therefore, they suggested that the factor that determines the skill level in Kendo is not a difference in action patterns but the styles of play that the participants choose. The results are widely expected to help build strategies in sports, lead to further understanding of the dynamics of behavioral judgment and its implementation, and be applied to emergency procedures based on behavior analysis. "Human behavior might have various regularities, just like natural and life phenomena. There are many mysteries remained in complicated actions in sports. I believe that to unravel those mysteries will lead to a further understanding of human beings." "Surprisingly, we are not really aware of our own behavior. If you shift your focus on the movement of mind as well as that of body, you might find out what you think obvious is not that obvious. What is important in research is not whether you can do or not, but whether you dare do or not."